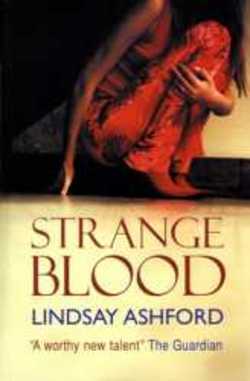 Lindsay Ashford's "Strange Blood" made it onto the shortlist for the 2006 Theakston’s Old Peculier Crime Novel of the Year and she was there for the panel that made the announcement of the winner. Published by the independent Honno Women's Press, this novel and author was a bit of a "curve ball" in the proceedings, with many saying "Who?" But, power to her elbow and every other joint, Ashford made it to the shortlist as a result of reader voting, and I think that the (late) Ottakar's branch network had a lot to do with it. Ottakar's had a presence in Wales, but nothing to shout out about, so you cannot cite the Welsh factor when it comes to voting. This book was popular because it was good in the eyes of readers. Let's take a look at what got Ashford on that shortlist. This is the second in a series featuring psychological profiler, Megan Rhys, the first being "Frozen". It's both exciting in the anticipation and a little straining to try out a new author. But this is Ashford's second crime novel, and there was no hint of "newbie on the block". It only took a couple of pages to feel safe and in the rhythm; this was self assured writing from the start. And, following the reading of the "who knows where this might lead" classic of Michael Connelly's "Echo Park", and Cathi Unsworth's "tying up" in "The Not Knowing", this was a classic WHODUNNIT. Not a cheat in sight either; the clue was there, albeit "...". But I won't spoil it for you! A classic on the "whodunnit" front, I think readers who seek this kind of novel will love this. This is not a "police procedural", but it does have insight into the workings of the police from someone who works with them. Megan, the psychologist and protagonist is an interesting creation with much to make her a sympathetic but strong character. Find more about the novel here, where Ashford talks about the background to the story. This is another "open lid" on society today, with page turning resonance. Lindsay Ashford is a writer to watch!